Material Download for TS100 mini Soldering Iron - Mini Soldering Iron TS100 - MiniDSO产品技术交流 迷你示波器-袖珍示波器-示波器探头- - Powered by Discuz! OK, first of all, You have done well good work on the Firmware ! Thank you. So I just relax and wait for your V2.17 source-code release. In Version 2.16 the Parameters for Sleep- and Idle-Time are (low)limited to 60 or 100 seconds. I use the TS100 on my Motobike-travvels. So I want to protect Battery from discharge. Therefore the Parameter for "OffVolt" should be settable to higher Values. I think 16 V is a good upper Limit for this Parameter. If the Source-Voltage gets lower then the "OffVolt" Setting the Display just resets. Do you have the .hex file? I can not compile the source code. I do not have IAR 6.4. Now if you TS100 does't work , You can try to upgrade the TS100 APP 2.11 .
recently I bought a iron soldering ts100. but it has not worked. . I disassembled and saw that one simply does not soldered capacitor. on electric circuit he have #23. tell him capacity. that I could find a replacement. C23 is designed to be empty, so there is no capacity. Could you explain how the soldering is not working? What does it display on the LED screen? What power supply do you use? 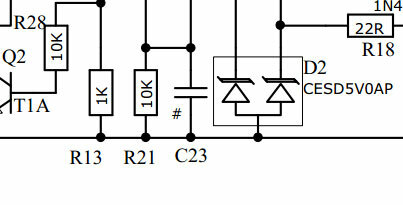 If you use 12V power supply, the current must be more than 1.5A. I use 12V and 3A power supply. When I click on the button immediately terminates heating. for greater understanding link for video. If TS100 still can't work. Please check your power supply, and recommend the use of 19V 2A power. Hello. you can do APPv212.hex for the left hand? GMT+8, 2019-4-22 22:12 , Processed in 0.142936 second(s), 25 queries .